I want to start by admitting that I didn't take one single picture of Christmas this year. This was partially due to the fact that I lost my camera battery charger for the millionth time, and yet even once I found it and charged the battery I still didn't take pictures. So I really have no excuse. Any picture you may see below my aunt took and those were actually not totally Christmas related. Christmas eve at Seth's uncle Skip's house with his mom's whole family was a treat to get things started. Seth spent most of the night taunting his little cousin by telling him he was 10 instead of 8 and getting everyone else at the house to agree with him. Lots of good food and passing of the sonogram pics made for a good time had by all. Christmas morning is always a blast when you are married to Seth. His mom, the genius that she is, decided a long time ago to make her kids work for their gifts. I don't know if they just thought Santa left clues and riddles for all little children or if they knew they were special. Either way, when they were little Seth and Levi both had to follow the clues to reach their big Christmas gift. They would open other assorted gifts and then get started with the first clue that would lead to some obscure place in the house which then held the next clue (kind of like a scavenger hunt). As they got older this continued but got much harder (more on that later). So, Seth has decided to do the same to/for me until we have kids that can appreciate it in which case he says the job becomes mine. I managed to make it through my clues in under an hour. Each clue not only led to the next one but also to a wrapped gift that menacingly said DO NOT OPEN. Once I reached the final gift (in the dryer) I was allowed to open all of the gifts...I got a Wii!!! We then spent the next hour or so playing tennis and bowling which may now be the only way I even come close to staying in shape. Seth opened his boring gifts (again more on that later) and we got ready to start the day! We then headed to Lee's house for some fantastic breakfast and a few laughs as Levi painstakingly worked on his clues (which at age 22 now include crossword puzzles and word finds). Lee made up some story to get us to the back of her house where a flat screen tv was waiting for Seth from all of us (non boring gift)! Little did I know, there was also a fantastically comfortable glider chair for the baby's room for me from Lee and my mom. We are so lucky to have such great parents. 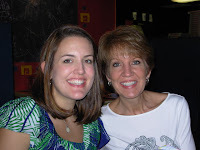 Next we headed to Marietta for dinner with Mom and Sara and more gift exchanging. I brought along the Wii and I must say I may start taking it everywhere with me. Mom made a delicious dinner so it made me happy that we could work some of it off! So Christmas was then over right? WRONG...I have now discussed with various people the fact that Christmas now is actually a week for a lot of people and not a day. Why? Well, there's divorce....that's usually the leading cause of going 18 places for the holidays. Throw in new marriages and you could have multiple parents and grandparents in multiple places to cover. Off to Americus, GA we go to see my mom's whole family. We crammed everyone into Grandma and John T's den yet again this year...we were plus two new spouses, a new adorable little one for my cousin Laura named Anna Kate, and a teeny tiny puppy my cousin Brandon gave to his wife Angela for Christmas. Otis (mom's dog) was there too. As you can imagine, you really only have to sit and watch to enjoy yourself. 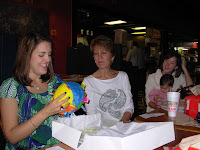 Saturday morning my aunts, cousins, and cousin's wives gave me my very first baby shower! It was so sweet and exciting to get cute baby gifts. This past week I have been feeling especially pregnant (in other words, large and in charge) so it was quite fitting to get the parties started for Pickle Burrow as our little one is known thus far. Sunday we met my dad and Liz in Warner Robins. Unfortunately, we missed the fun family festivities at my aunt Linda's house this year. It's so hard to see everyone! I'm glad we got to spend time with my aunt Linda, but my cousins will have to be harassed by Sara and I at a later date! Seth had to go back to work on Monday, but dad took Sara, Liz, and I on the great tour of his beginnings....we went back to the old farm which isn't so old looking anymore. We went to Roberta, GA where my dad went to elementary school and to Ft. Valley, GA where we got to see the old theater where dad saw his first movie (Flipper). Again, I wish I had taken more pictures. I have to get better about that before this baby comes....especially since dad and Liz got us a new video camera! I am still here! And I anxiously await the next time you blog. I am so excited to move back and watch as the little pickle grows!